Tropical Storm Erick approaches Mexico's Pacific coast, strengthens and expected to become a hurricane. Tropical Storm Erick kicked out increasingly strong wind gusts as it approached Mexico's Pacific coast port of Lazaro Cardenas on Friday, and a large swath of the country braced for drenching rain. The Mexican government extended tropical storm warnings to cover the area from the Pacific tourist resort of Zihuatanejo in Guerrero state to Cabo Corrientes in Jalisco state. The area encompasses Lazaro Cardenas and Manzanillo, the country's top cargo shipping hub. 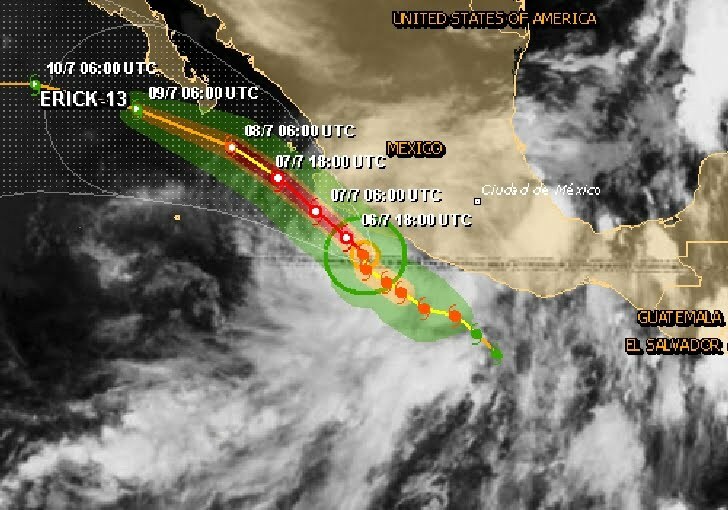 At 2:00 hr PDT the center of Tropical Storm Erick was located near latitude 17.3 north/longitude 103.6 west, about 205 km/ 125 mi SSE of Manzanillo Mexico about 905 km/565 mi se of the southern tip of Baja California. Erick is moving toward the northwest near 13 km/h- 8 mph. A general northwest to west-northwest motion is expected over the next couple of days. 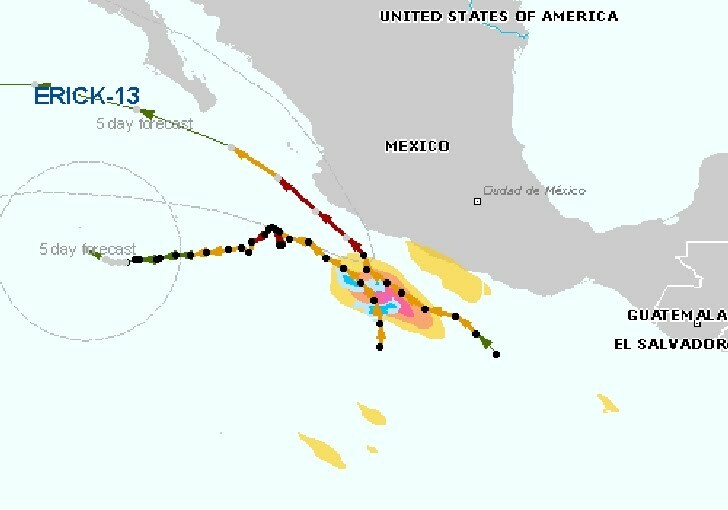 On the forecast track the core of Erick should move parallel to but remain offshore of the coast of southwestern Mexico. However...any deviation to the right of the forecast track could bring the center near or over the Pacific coast of Mexico. Maximum sustained winds are near 70 mph...110 km/h...with higher gusts. Strengthening is expected today and tonight...and Erick is forecast to become a hurricane during the next few hours.